First Time on SEOclerks We provide Affordable Australian SEO services. We will Increase your Website Sales and SERP Ranking on Local Australian Search engine. 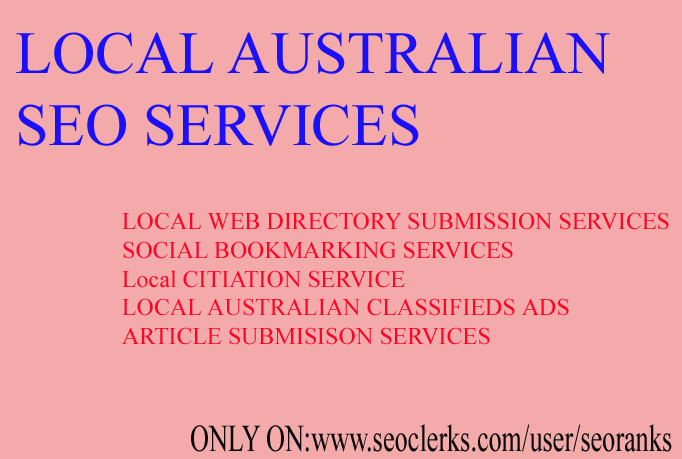 No body provide Local Australian seo service, In these gigs I will do 20 Australian web directory submission services in Just $5 . You can also check my Extra gigs for Incresing your Website ranking. Why seoranks Australian seo services ? Because we make it our mission to help your business to increase sales and enquiries, drive relevant traffic to your website, and get real results for your business. I will provide Australian seo services is ranked 5 out of 5. Based on 3 user reviews.